Lennart Moheit, a PhD student at TUM, notes that “acoustics and vibration is a wide scientific field that has a lot of practical applications.” The study of acoustics is important in many areas, such as civil engineering, fluid mechanics, and thermodynamics, and has just as many (if not more) uses, like improving room acoustics, analyzing anechoic coatings, and even explaining false poltergeists. One way to teach students about acoustics and the underlying theories is to use traditional experiments. However, some experiments are expensive and have difficult and time-consuming setup procedures. Additionally, Moheit notes that certain experiments need special laboratory conditions and rooms that might not be available, such as anechoic chambers and reverberant rooms. 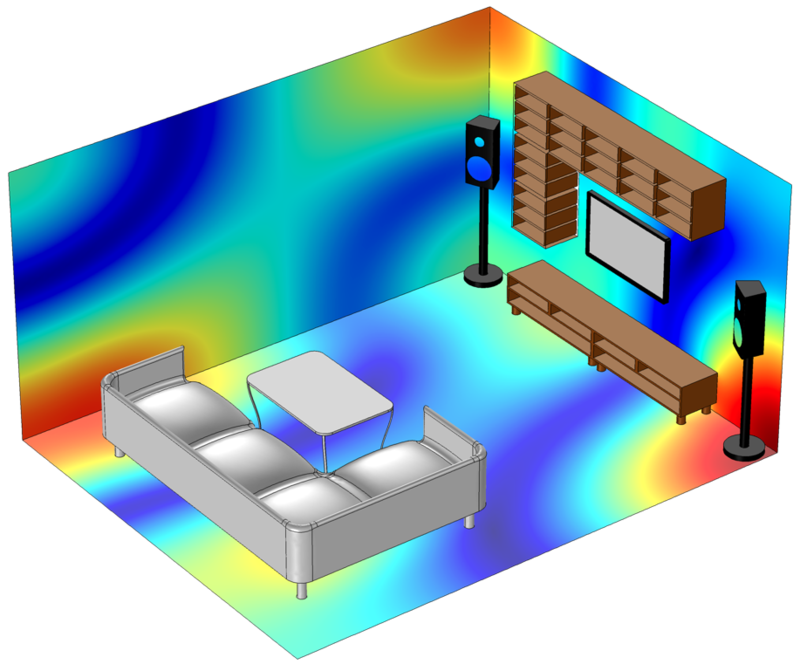 Simulation of the sound pressure distribution inside a room. To address these limitations and create another way to teach acoustics, Moheit designs customized apps for educators. 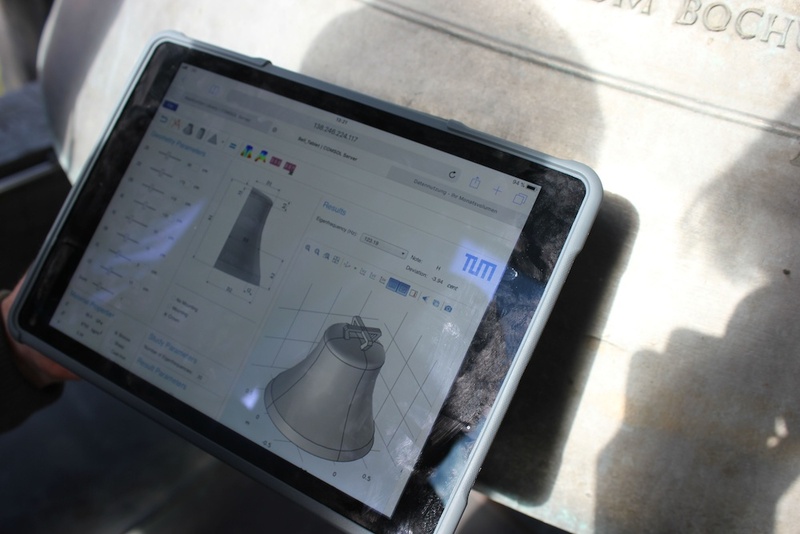 The idea came to him after attending a COMSOL workshop in which he was introduced to apps. 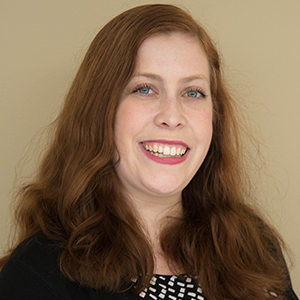 Moheit says, “I immediately thought of using acoustics apps for educational purposes because I was experienced in working with COMSOL Multiphysics® before and had a really clear idea of the possibilities of such a concept. 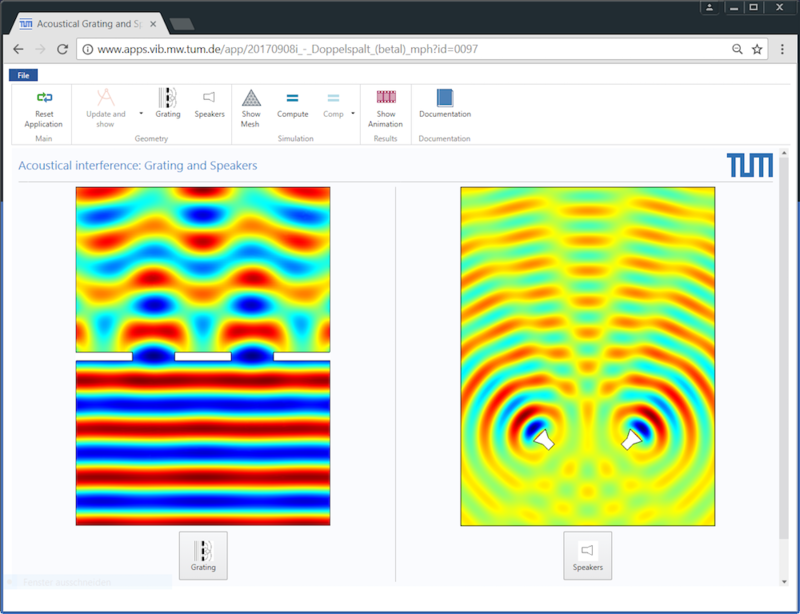 Especially in acoustics and vibration, there are a lot of phenomena that can be simulated and visualized very well using the finite element method (FEM).” To further expand on what can be simulated with this software, the Acoustics Module, an add-on product to the COMSOL Multiphysics® software, contains other dedicated numerical methods as well. These include the boundary element method (BEM), discontinuous Galerkin finite element method (dG-FEM), and ray tracing methods. A major benefit of using apps for this purpose is that they clearly demonstrate different phenomena, including more complex theories, without the need for extensive experimental setup. Apps are particularly helpful in acoustics because they have the ability to “visualize things we can’t see but only hear in reality,” Moheit notes. Specialized apps, such as this one for analyzing gratings and speakers, visualize phenomena — like interference — that can’t be seen in real life. Image courtesy Lennart Moheit. 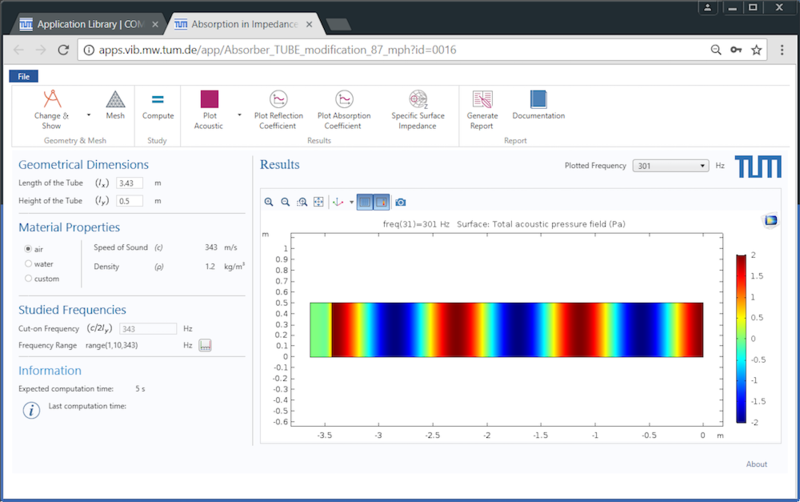 Simulation apps run detailed calculations in the background, where unnecessary details are hidden from the user via a simplified user interface (UI). As a result, students don’t have to be simulation experts to use apps. They can simply change predetermined parameters by making adjustments via the app UI and receive results based on their choices. 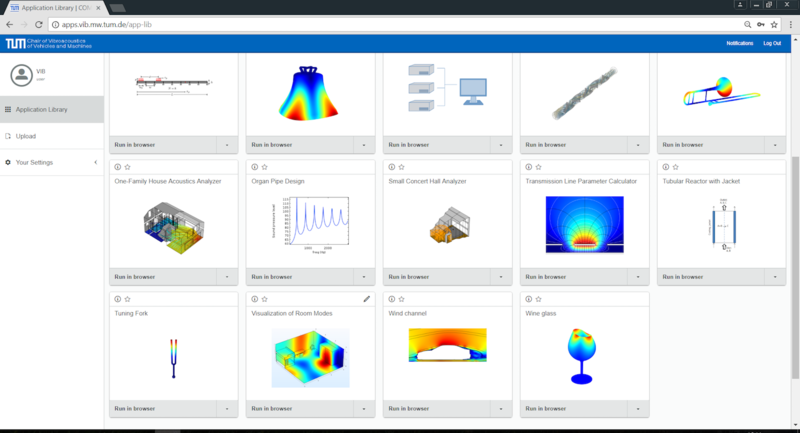 To deploy and share apps with students, educators can use the COMSOL Server™ product. 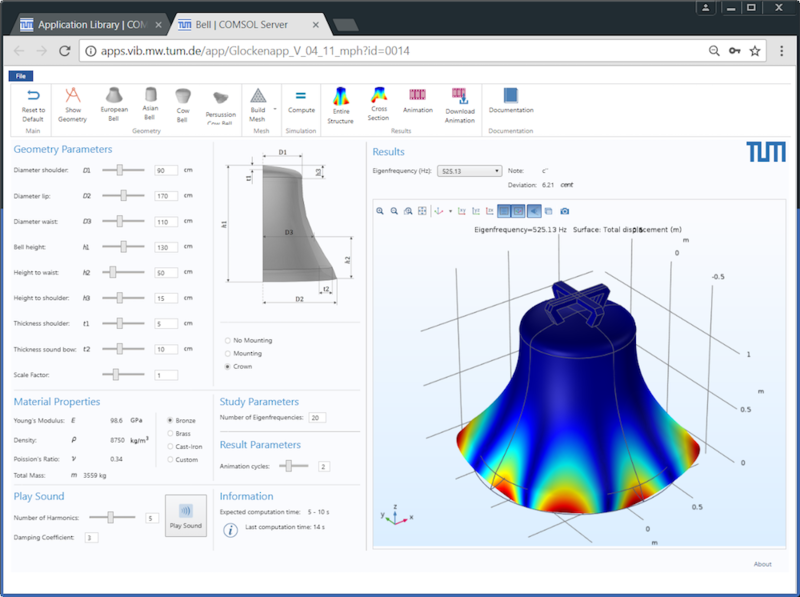 COMSOL Server™ enables users to access and run apps through web browsers using computers, tablets, and even smartphones. This makes apps easily accessible — both in the classroom and at home. 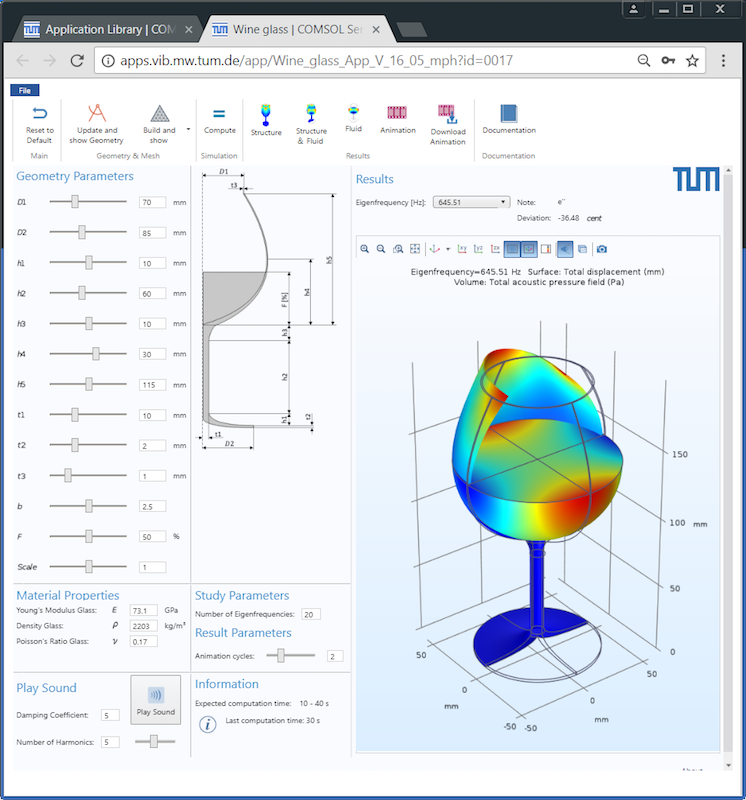 Drawing from inspiration, Moheit worked with the chair of the Vibroacoustics of Vehicles and Machines group at TUM to create a virtual learning platform called the “App Server” that provides freely accessible, interactive apps. As a note, the App Server and some of the apps mentioned in this blog post are still being worked on and improved. The TUM App Server. Image courtesy Lennart Moheit. Let’s take a quick look at a few of the apps Moheit helped build. One app Moheit created is for simulating room acoustics, similar to the one mentioned at the beginning of this blog post. In this case, the model is of a Munich subway car, easily recognizable to TUM students. This app visualizes a mode shape with high (red) and low (blue) sound pressures at a certain frequency. Using these results, students can locate loud areas in a subway car at a specific frequency. In the loud areas, passengers can experience an unpleasant humming noise that can make it more difficult to hold conversations — practical concerns that the students can easily understand. Moheit mentions that, in the future, this app will be expanded to include typical room acoustics calculations, such as reverberant time, sound wave propagation, and reflection and absorption at the walls. 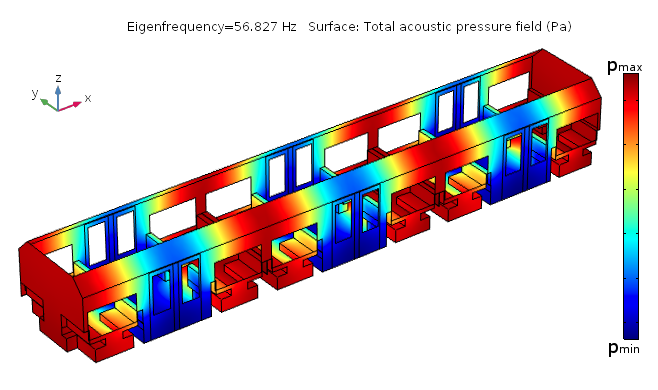 The simulation results of the room acoustics app, showing a mode shape inside a subway train. Image courtesy Lennart Moheit. An app featuring a wine glass helps students understand the structural dynamics of different designs, making it simple to alter the shape and material of the glass as well as the fluid volume (deciding if the glass is half full or half empty is up to the user). The results show the musical note of the natural frequencies of the glass and can be compared to measurement data. As a bonus, this app can also provide hints as to why glasses break when they are excited by one of their natural frequencies where they get in resonance. UI and results of the wine glass app. Image courtesy Lennart Moheit. Next up is a bell-themed app made to investigate the structural dynamics of different bell designs. Using this app, students can modify the geometry and materials of a bell, eventually finding the natural frequencies of the vibrating bell as well as the corresponding musical notes. Users can also visualize and animate bell vibrations. This app aims to enhance the students’ knowledge of how bells create sound, from the initial vibrations to when the sound reaches a listener’s ear. Left: The UI and results of the bell app. Right: A photo of the bell app in use. Images courtesy Lennart Moheit. 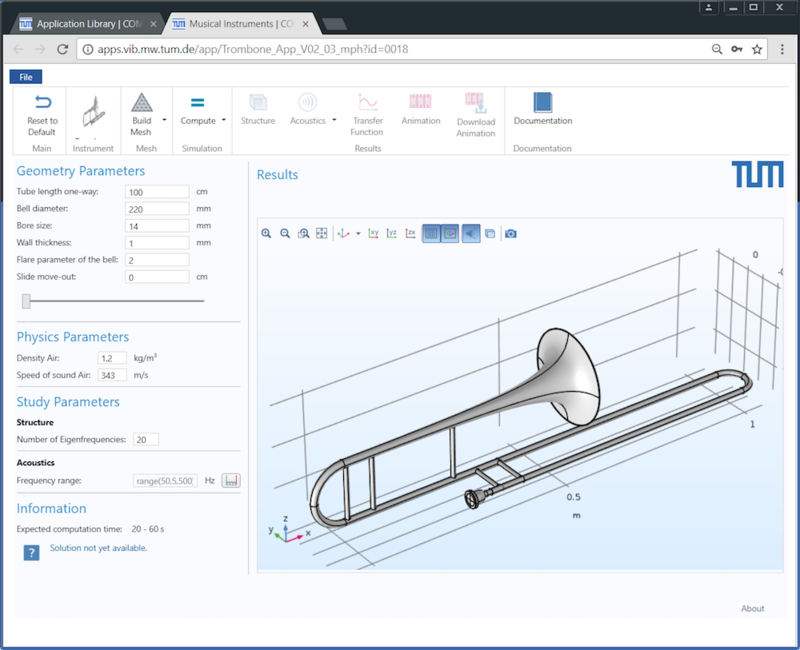 Other virtual experiments within the TUM App Server include an app for analyzing the operation of a trombone and an app of an impedance tube. Left: A trombone app is the only musical instrument app available at TUM at the moment. Right: An impedance tube/duct app, which is a common academic problem. Images courtesy Lennart Moheit. In the future, Moheit notes that acoustics apps could be used by people of all ages and learning stages. For young learners in particular, “the digital, interactive learning concept might be understood as a kind of game and can help make the content more accessible for people who don’t like physics yet because it seems to be too theoretical to them or they didn’t understand the reason for all of the equations,” Moheit explains. Acoustics is a good topic for younger students, since it is a wide scientific field with many practical applications that can be easily understood. Of course, these are only some of the possibilities of educational acoustics apps. If you have any ideas for using apps to teach acoustics, be sure to let us know in the comments below!